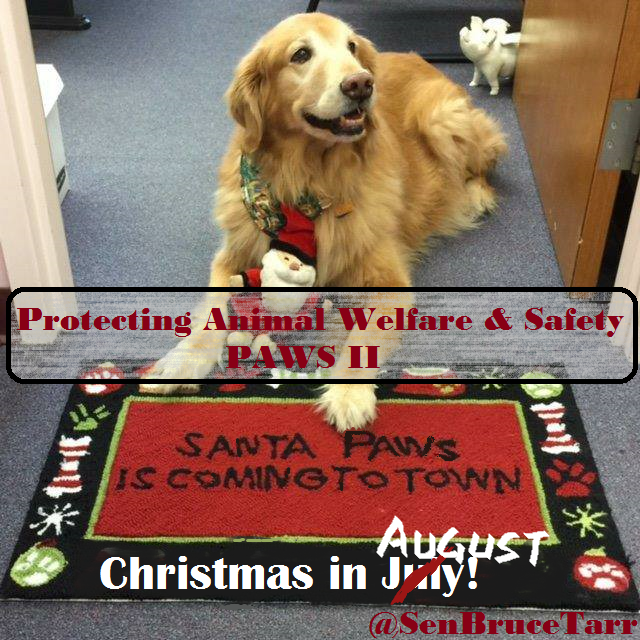 Very happy to report that my bill to enhance the protection of animals from abuse, PAWS II, is headed to Governor Charlie Baker to be signed into law. Boston- Legislation intended to enhance humane treatment of animals, and punish those who engage in animal cruelty, has received final legislative support following approval by the House and Senate today on Senate Bill 2646, Protecting Animal Welfare and Safety. The legislation furthers anti-abuse measures first secured in the 2014 Protecting Animal Welfare and Safety bill. Senate Minority Leader Bruce Tarr (R- Gloucester) led lawmakers to adopt the bill, also known as the PAWS Act, following the discovery of extreme abuse and cruelty in the case of a dog that was stabbed, burned, cut and had bones broken. The “Puppy Doe” case led to the arrest and conviction of Radoslaw Czerkawski who was recently convicted of 12 counts of animal cruelty and sentenced to 8 to 10 years in prison. Senators gave initial approval of the bill unanimously in March. The House and Senate have enacted the bill which now moves to Governor Baker for his signature. MSPCA-Angell was absolutely instrumental in their support, advocacy and passion for the enhancements of humane treatment for animals in this bill and their work every day.